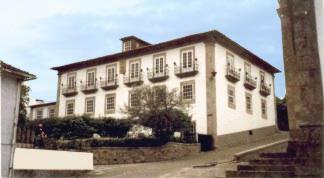 Accommodation at Casa Nobre do Correio-Mor. This house remains very much the home of the charming owners who fill it with their music and dancing for the delight of their guests. 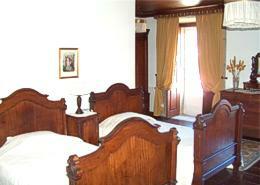 Restored to highest standards with modern facilities blending with the original gracious living. The house has finished a major restoration and the sense of grandeur of a former age is immediately apparent on going into the entrance hall. Other buildings, which overlook the swimming pool, have been incorporated into the main house with a separate area for the large Jacuzzi, sauna and turkish bath. There is also a table tennis table. 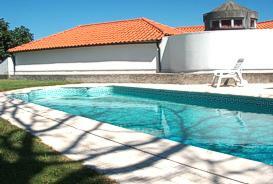 Swimming pool dimensions are 10 by 4 meters with depth varying from 0,8 to 1,60 meters. Above this is a large living room and recreational room for guests with DVD and VHS player, satellite television, games table, snooker etc. The full length windows open in summer to the wonderful view of the swimming pool and across the roofs of Ponte de Barca towards the mountains of Serra Peneda and Serra Soajo in the Peneda-Geres National Park. Guests should make a visit to some of the villages in the Park since they are still living and working with the same methods and conditions of generations before them. There are villages where the village council allocates all the work in the village on a daily basis. Until recently the villages were self sufficient and money was not necessary within the village - barter being the method of village trade. Houses are made from unhewn rocks and each evening the cattle and goats come into the village to spend the night underneath the houses, safe from the Iberian wolf that roams the hills. With the European Union came the funds for electricity and road access. The old water mills are going into disuse and being replaced by white bread bought from vans. This house belongs to a bygone age with many servants and gracious living. Pilgrims on the old pilgrimage route to Santiago do Compostela were offered sustenance when passing the house. The old kitchen has now been turned into a breakfast room with all the old granite hearth and washing places are exposed in their original glory. Throughout the house the restoration has found the original masterpieces of the stonemasons From shelves that once were used to store "bacalhau" which are now shelves in a bathroom, a granite wash basin in a bedroom and even a granite toilet from before the days of the 'water closet'. Luckily no longer in use since it forms a feature of the wall in the main passageway! All the 9 bedrooms and the suite have been furnished with the original furniture of the house which has been lovingly restored to original condition. 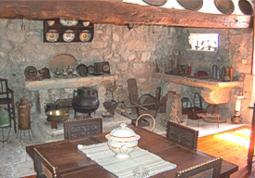 In the library and other places through the house can be seen the items collected by the present family's grandfather during his period as a doctor in Africa. In the basement, the wine is still made in the traditional fashion using the grapes grown on the lands of the estate in the surrounding villages. 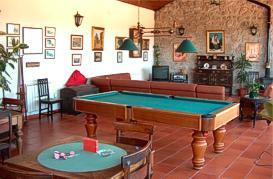 The house has central heating which makes it an excellent place for a group visit in winter, either to play golf on the much acclaimed Ponte de Lima course or, by companies wishing to have meetings of key personnel away form the pressures of modern day life. There is wireless internet and under request it is possible to supply a computer. A laundry room is also available for guests. There is free public car parking near the house. Restaurants and shops are just a short walk from the house.